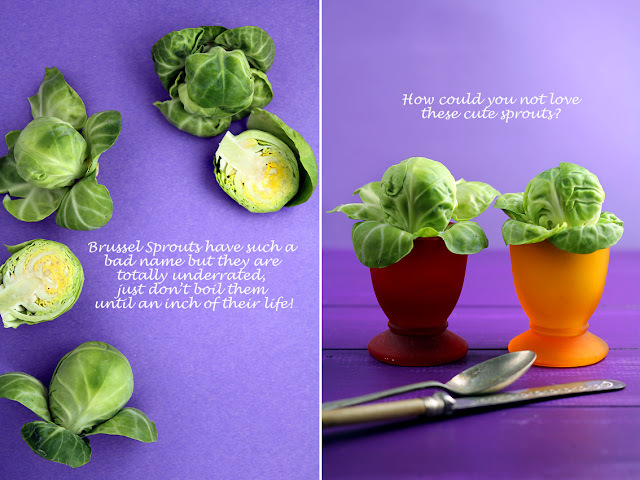 I never grew up with brussel sprouts, I never had to endure a miserable soggy boiled sprout that was forced upon me, just so I could leave the table. My sprout memories are good, in fact I have great sprout stories of crunchy, flavoursome, good looking sprouts that I can't get enough of. And for this reason, our sixth food fight was decided. I wanted other people to experience sprout fever, which is happening in my house at the moment. I have been experimenting lately with photographing food as it would appear in the pages of a magazine, or a cookbook, I just love how my sprouts turned out. Ok, I know I said boiling is the reason sprouts have got a bad rap, but you need to boil them only for 4 mins to soften them ever so slightly. Don't overboil! Drain in a colander, drizzle olive oil and mustard then sauteed them in a pan on medium high heat, tossing them frequently until the sprouts have crisped up. According to a 2002 survey, Brussels sprouts are the most hated vegetable in Britain. Brussels sprouts contain something called sinigrin, a glucosinate that may prevent colon cancer according to research. Chef James Martin has developed a Brussels Sprout ice-cream and a cocktail called the "Sproutini" - made from vermouth, gin and sprouts frozen in ice cubes. 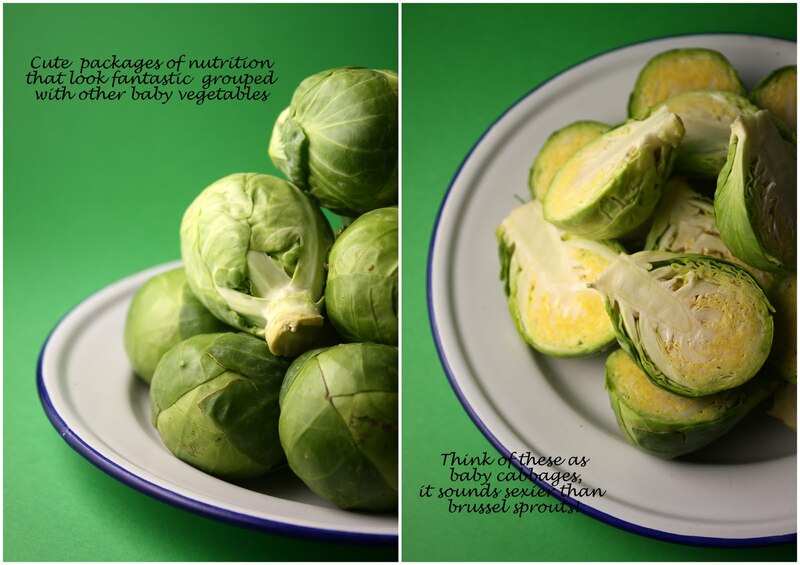 Brussel sprouts nutritious and tasty! As Ingrid said we were fortunate to NOT grow up with soggy sieve through your teeth vegetables and brussel sprouts are not a memory from my childhood. My earliest memory would have to be whilst in Europe, in particular Ireland. Christmas dinner was never complete without the good old sprout! I was Comme ci, comme ca about them as they were usually just boiled. I like flavour, crunch, spice and excitement - plain boiled veges are not my cup of tea. I really don't know how the brussel sprout and a mustard dish came about - they just marry perfectly and are pleasure to eat. My challenge was to create another dish to add to the "I love sprouts" fanclub! Initially I though of sprouts with a cheesy sauce but being a busy mum with a sometimes clingy and demanding three year old - quick and easy was going to be my motivation! 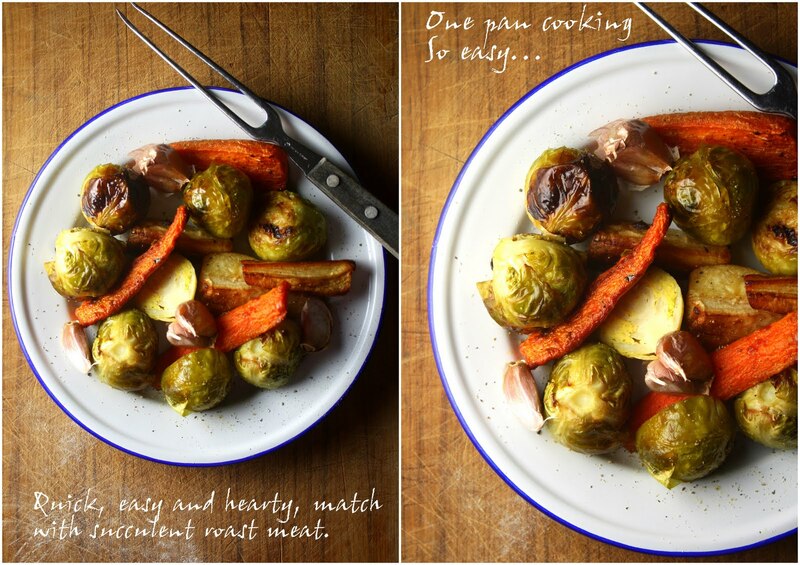 Roasting - I love roasting things, its super easy and you cant fail at it BUT can you roast a brussel sprout? Often I check with my buddy Mr. Google, this time I just threw it all in to the pan drizzled it with olive oil and salt and hopped for the best. Voila - beautiful and tasty brussel sprouts - easy and different. Brussel sprouts with any yellow leaves taken off and the bottoms cut off. Roast for about an hour - keep checking the sprouts as the leaves can crisp up and burn. You may have to remove them prior to the other vegetables being cooked. Enjoy and wow your family! I love your sprout fever, years of soft sprouts put me off them until a friend introduced me to them quick fried with garlic and ginger and in was converted. Trying the roasted ones tonight, I was subjected to the boiled to death sprouts (yuck) I am looking forward to trying both of these recipes. Let us know how you get on, would love to know if we've managed to convert you. 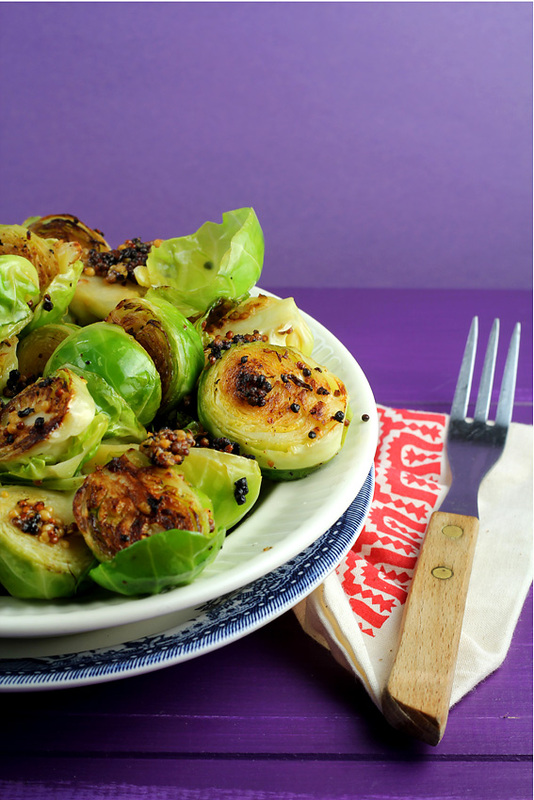 yummo - I love brussel sprouts especially with a little olive oil and bacon - sooo delicious! I don't have much experience with brussel sprouts, but I had some a few months ago that were very tasty and decided to give them a second chance. I tried the first recipe with the mustard and olive oil. Delicious! And it was so easy. Thanks for the heads up :).